This is my latest offering for ‘Latitude quilts’. The theme was ‘The sounds of silence’. The ‘Sounds of Silence’ was a tricky theme, as there are very few situations where there is no sound. What is it like to be deaf? Is it silent on the moon? Then I thought of the saying ‘All is Silent on the Western Front’. Being an avid reader of first and Second World War history, I remembered the pictures of pastures and woodlands turned into a muddy wasteland. 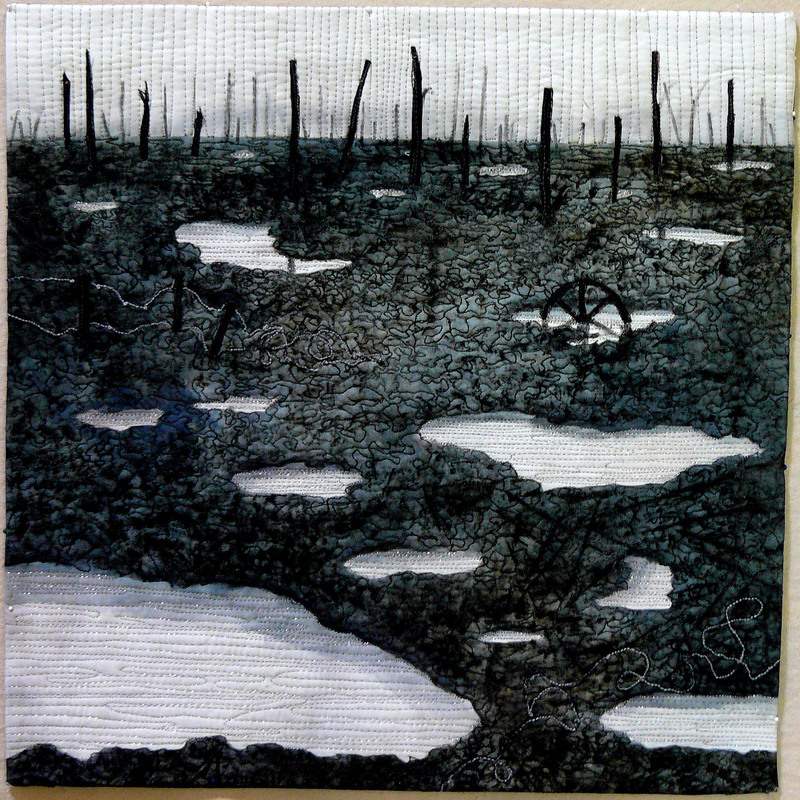 This piece is meant to reflect the silence after the catastrophic winter battles on the Somme. At the recent anniversary of 9/11, I heard about a man who dug his way up and out of a collapsed tower. When he crawled out and looked around, he said what he remembered most was the absolute silence. Using some reference pictures from books I drew up my own composition. I decided to have a large land mass and small sky. Using this drawing I made a freezer stencil mask. To reflect the sombre mood, there is no colour. I chose a piece of mottled hand dyed grey fabric as my starting point. I then discharged all the parts I wanted white (the sky and the craters). I then masked them off and applied a shiva stick rubbing over various handmade collograph plates. These were made previously with things such as toothpicks and lace glued to cardboard and varnished. The reflections were added with Inktense pencils. The trees, wheel and fence posts were fused on lastly. I usually thread paint my pieces with a stabilizer before I layer them up and quilt them. This time I decided to go straight to the quilting. I used horizontal lines in metallic and rayon threads for the puddles. To offset this, the sky was done in vertical lines. 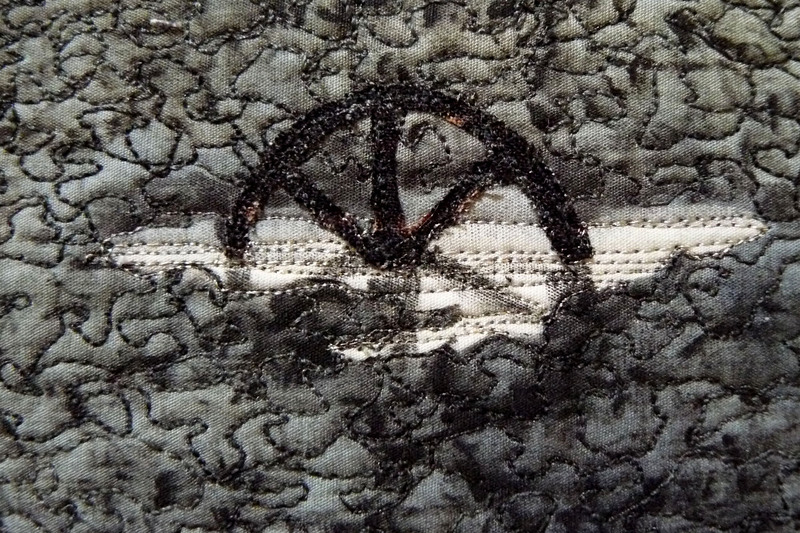 The ground was quilted in a heavier variegated thread (Valdini) in a squiggly pattern that got smaller and more horizontal towards the horizon. I tried to add a canon gun with the wheel, but it just didn’t look right. This perhaps would have added more weight to the theme. I will also experiment more with the barbed wire- I executed it with bobbin drawing this time and I’m not sure whether this quite worked. There must be a better way! This was a quick and satisfying quilt to make and one I would like to make into a larger and more considered piece. This would be especially significant as the centenary of the first landing at Gallipoli (and subsequent First World War events) is coming up in 2015. My great grandfather was in the first landing of Australian soldiers on April 25th, now our national day of remembrance, Anzac Day.